When two fighters, who are almost evenly matched, fight multiple times, the outcome of each bout eventually becomes subject to the law of probabilities. In other words, the more times the combatants fight, the greater each one’s chance of losing – or winning. Applying this same law to Manny Pacquiao and Juan Manuel Marquez, if they fought 10 times, they would probably win five fights each, on average, minus of course the controversial decisions from the judges. Now, after four fights, the question is, when is enough enough? After such a sensational ending to the fourth fight, an unbiased person would assume that the story has finally ended. Game over. Marquez finally silenced his critics. Despite Pacquiao leading the series 2-1-1, Marquez has the one thing Pacquiao doesn’t: a clear, convincing victory. Ironically, such an emphatic win has fuelled the vicious cycle and the demand for yet another fight. Was it not just a lucky punch? Didn’t Marquez himself look like he was about to get stopped? What made Pacquiao Marquez IV so thrilling was that both fighters were going for the knockout. And part of the demand for another fight stems from the fight’s shockingly abrupt ending. Marry all of that with the fact that Pacquiao scored a clear win over Bradley, who himself comfortably beat Marquez, and talks of Pacquiao Marquez V now look to be gathering steam. 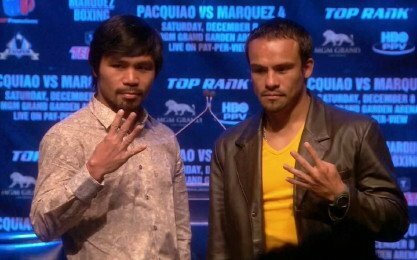 However, a fifth with Pacquiao would be disadvantageous for Marquez for a number of reasons. Firstly, this fight is his to lose. In other words, if it were Pacquiao that had knocked Marquez out there probably wouldn’t be any talks for another fight. Secondly, before the knockout, Pacquiao was beating him up. Despite the knock down and favorable result for him, the story of the fight was that Marquez was losing and taking a battering at the same time. Even his coach, Nacho Beristain, admitted his fear when Pacquiao started throwing the kitchen sink after the first knock down. Thirdly, unless he scores another knock out, the result of another fight will dull the shine that is still emanating from his fourth fight victory. Marquez should stay away from Pacquiao because, after literally putting the matter to sleep, why repeat something he’s already achieved? Pacquiao’s desire for another fight is understandable. From a fan’s perspective, this could very well be another entertaining fight. But for Marquez, taking a fifth fight could also mean throwing away a precious piece of legacy that took him four fights and eight years to achieve.